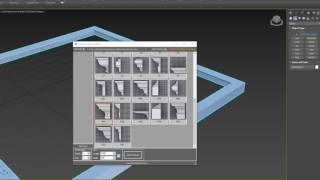 Script for a quick and convenient build architectural profiles with modifier Sweep. This free pack includes the 10 prepared to using architectural profiles. Will it be available for Max 18 ? Best script, may I ask will it be available for Max 2018 ? i tried it with max 2018 but not work! can't even find the script! descargue la nueva version pero aun tengo problema con la instalacion del plugin puedo abrir la interface, pero no veo los settings, gracias. it's not work on 3ds max 2017 why? Hi! Soon will be fixed. Thanks for your feedback! Hi!&#13;&#10;Soon will be fixed.&#13;&#10;Thanks for your feedback! Every 3DS Max on my machines have this! It means-useful! Get it guys. Thanks K-Studio! It is not compatible with Autodesk 3ds Max 2015. Why? ..or when will it be? Last Updated: 6/20/2014... To bad, I could use it soon. Estos modelos son excelentes para arquitectura.